Is Your Project Management Workflow Process Broken? When it comes to delivering results, a smooth project management workflow can make or break your team. Unfortunately, too many people are used to working with mediocre or even poor project management workflow processes. This lack of effective processes explains why, as the Standish Group reports, nearly two-thirds of projects are not completed on time or within budget. If you haven’t worked with an effective process in the past, you may not know where to start improving your current project management workflow, even as you’re missing deadlines or frustrating your team. Luckily, there are steps you can take to correct those issues. This guide will help you recognize what’s broken in your process—and teach you how to fix it. Before fixing a broken project management workflow, it’s important to understand how an effective one works. A good process relies on project management best practices to facilitate clarity and communication. At a bare minimum, efficient project workflow management consistently delivers products that meet established requirements, and it delivers those products on time. Why bother to bring your process up to this level? Consistent results satisfy clients. Likewise, consistent results also satisfy the development team, as members work together to efficiently produce deliverables. Team members understand expectations and are empowered to get their work done. The project management workflow process helps to remove any roadblocks the team encounters, preventing any work pileups. Keep in mind that the ideal project management workflow is possible through a variety of methodologies. Your team can use agile or Waterfall or another methodology entirely—it doesn’t matter, provided your project management workflow is a good fit for your team. Whatever the method, you can use a project management workflow chart to make sure that your team is on the same page and that everyone understands their role. Your team delivers products after the established due date. The delivered product does not meet established requirements. The requirements keep changing throughout production. Project continually pile up, overwhelming one contributor or department. Roadblocks keep the project from moving forward. Just as any methodology can work as an ideal process for your team, any methodology can break—particularly if you haven’t fully implemented it. So if simply switching methodologies isn’t necessarily the answer, what can you do to fix your broken process? The truth is that there is no one easy trick that will fix all your project management workflow problems. However, you can try making adjustments to your process that will improve workflow. First, consider whether the problem lies with your process or your deadlines. Are the deadlines you’re setting feasible, or are they based on wishful (or ignorant) thinking? 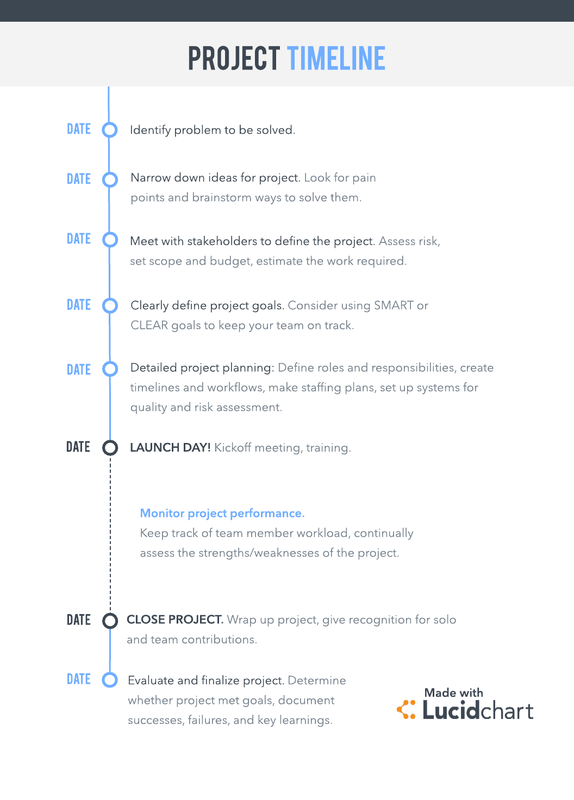 Rather than just assigning a due date, build a project management timeline at the beginning of your project. A realistic deadline will help your team stay motivated and save clients from disappointment. Once you set deadlines, perfect your handoff strategy so you won’t waste time figuring out who gets what when. 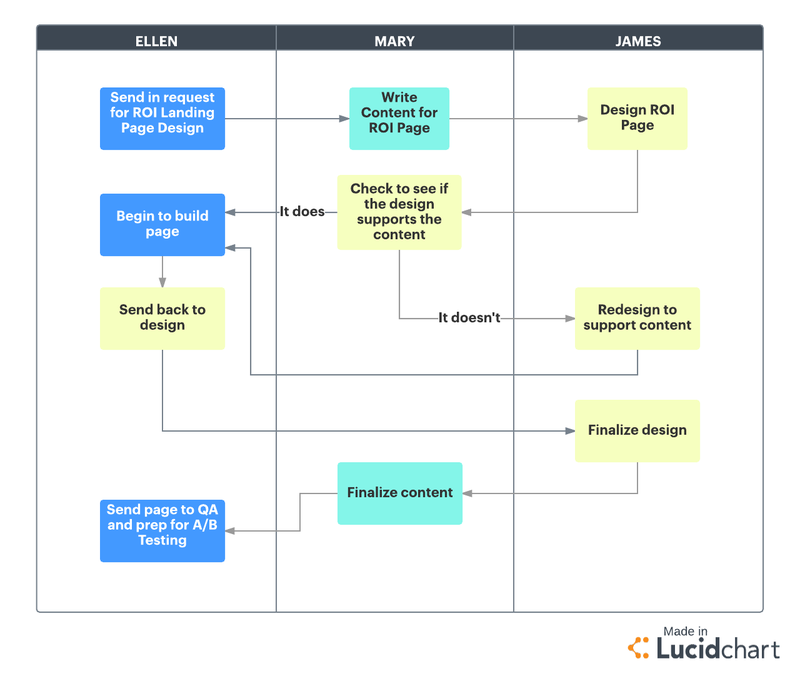 Use Lucidchart to customize a process flowchart for your team and eliminate any confusion about the handoff strategy. You can begin addressing this problem by examining your project management lifecycle. During the initiation phase, do you correctly identify the project’s scope and deliverables? Are they clear and well-defined? Murky requirements slow projects down and make team members uncertain, leading them to waste time seeking clarification rather than working. Moreover, your team can’t be expected to meet requirements that were never clearly planned. During the execution phase, do you effectively communicate with your team members, particularly in regard to the product requirements, project timeline, and details of each task? Proper documentation will make this communication easier. Document all requirements and give your team access. Projects often stall due to improperly managed bandwidth. Consider applying some principles from Kanban project management, such as limiting the amount of work in progress at any given time. This strategy keeps team members from slowing down projects with multitasking, and it encourages other team members to step up and to help move projects forward when they get stuck. You may also want to review your process and determine who is responsible for different points of the process. Are team members responsible for removing roadblocks? Is there a Scrum master who should deal with issues? More importantly, is everyone involved on the project aware of these roles? Clearing up the basics of your process can help your team address roadblocks quickly, keeping projects from getting stuck. While any number of problems can break your project management workflow, thorough documentation and clear communication can fix many of them. Use Lucidchart to keep your workflow running smoothly. 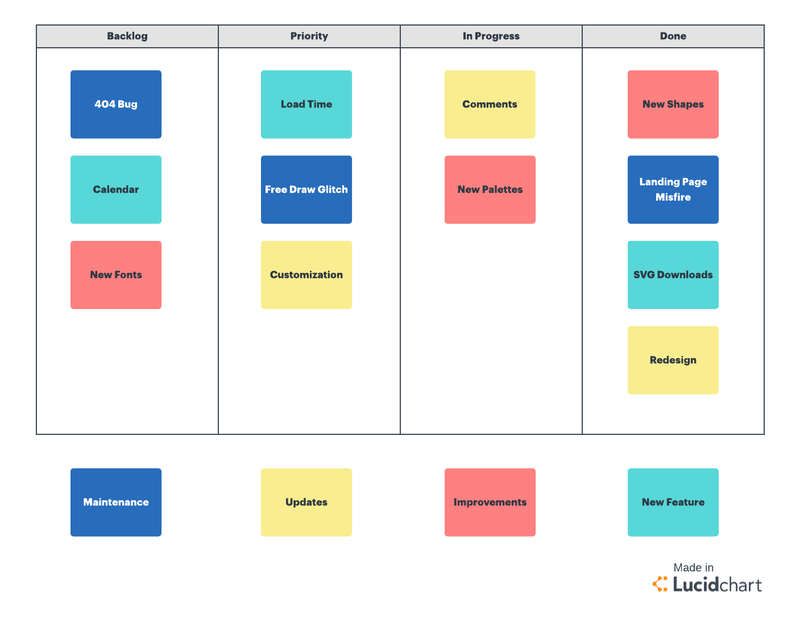 With templates for every project management style, Lucidchart makes it easier to keep your project management workflow functioning properly. You’ll be able to deliver quality products on time—every time. Try out a free Lucidchart account today!